Eight years ago I walked into my local humane society to adopt a pet rat. A few weeks later I was volunteering, and a couple years after that I had scored a part-time job in their humane education department. Within a few months, I was hired at a neighboring humane society full time. I’ve been at that shelter four years now and know without a doubt that working in animal welfare is my calling, and helping pit bulls is my passion. Who knew one little rat could change the entire course of my life and the lives of all the pit bulls I’d come to know and love? The shelter I currently work for is a private nonprofit humane society that also has animal control contracts with a few cities. 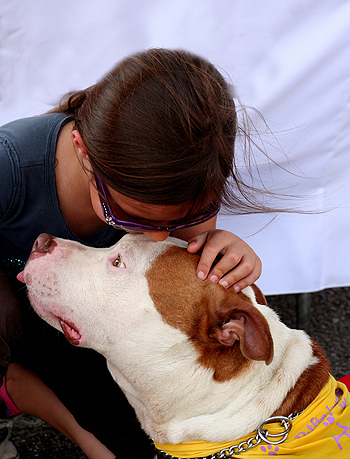 We take in over 6,000 animals a year, mostly strays – and in terms of dog, mostly pit bulls. For a gal like me who fell head over heels in love with the breed the moment I walked my first shelter dog (a white female pit bull named Blanca), I wouldn’t have it any other way. Coming to work each day to help care for the dogs I love best is truly bittersweet. Their big smiles, soulful eyes, goofy antics and willingness to give us a shot at changing their opinion of the human race is what keeps me coming back for more. Nothing cheers me up faster than watching our pit bulls do “zoomies,” aka “pit fits” up and down the play yards, listening to their obnoxiously loud vocalizations when playing with other dogs, or seeing them destroy a “pit proof” Kong in two minutes flat. I love watching the transformation of a scared new dog blooming into a social butterfly, or an emaciated and mange-ridden puppy growing into a fat and furry adolescent, or seeing an old dog get a little pep in his step when we pair him up with a wiggly new kennel mate. These are my morale boosters; this is my motivation. Sometimes I get so used to being surrounded by other staff and volunteers who are just as crazy about pit bull type dogs as I am that I still get thrown off when a customer has some negative stereotype they feel the need to share with me. 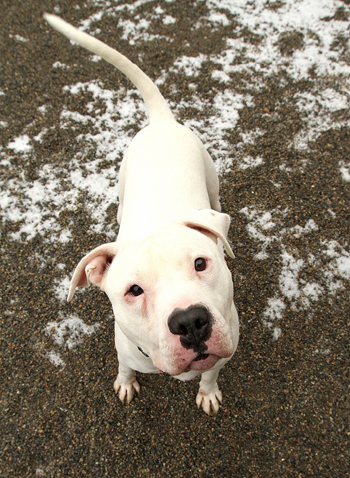 Every day I see my favorite dogs get passed over time and time again by potential adopters who don’t want a pit bull even though everything they are looking for in a new companion is sitting right in front of them in that cute little muscular package. I’ve even seen families fall in love with a dog, take him home where he sleeps in bed with their children, and then because someone tells them he looks like he may have pit bull in him, they bring him right back – not because he did anything wrong but because they choose to buy into everything that the media would have them believe being a pit bull means. Our staff and volunteers work so incredibly hard to care for all our animals and especially our pit bulls, but we can’t fix everything. Some of our animals come in with serious medical and behavior challenges; we’re always full; forever understaffed; and though we don’t euthanize solely for length of stay, we know the longer the dogs are living in a shelter environment (and pit bulls are always our longest residents), the more likely they are to develop medical or behavior issues, some of which we cannot cure no matter how much we love them or how many tears we shed over the thought of this world without them. Although pit bulls have many obstacles to overcome both in shelters and out in the community, I’m lucky to say the shelter I work for now treats them no differently than any other breed. They get the same medical and behavioral evaluation and treatment, the same chance at adoption, the same right to however much time is needed to find them a new loving home. I wish I could say the same about all shelters, and even about some owners. I’ve worked in shelters that were forced to euthanize for space, for time, for breed, for age, and for minor medical or behavioral issues. Yet with all the sorrow inherent in working in such an environment, I still felt like our dogs were better off than on the street, better off getting loved and cared for by wonderful staff and volunteers for as long as we could, and better off than being in the hands of cruel or neglectful owners. I believe in heaven, and I believe animals go there. If I didn’t there’s no way I could do this job. It has taken me years to gain the wisdom I have now, but after being exposed to the things I have, I know in my heart that there are worse things than death. I have held many animals as they’ve taken their last breath, and I’ve been the one to inject too. People outside shelter life can’t understand how we do it, but once you’ve been the one to walk straight to your favorite dog’s kennel every morning, kiss her on the head, take her out to potty, make sure she has soft bedding, toys, and a treat for months upon months and sometimes for over a year – if the day does come that you can no longer give her everything she needs to stay sane, to be healthy and comfortable, which is what every dog deserves whether they are in a home or a shelter, you will understand why we can’t imagine anyone else being the one there for her in her last moments. Our job is hard and it’s even more difficult when people not only don’t understand but also condemn us for doing our best. But we keep coming in every day, despite what anyone thinks or says because we’re not there for them. We’re there for the animals and our bond, our calling, our passion is stronger than any heartache people can put us through. Beautifully stated and those are beautiful pitties in the picture. It’s people like you that keeps us going and have hope. 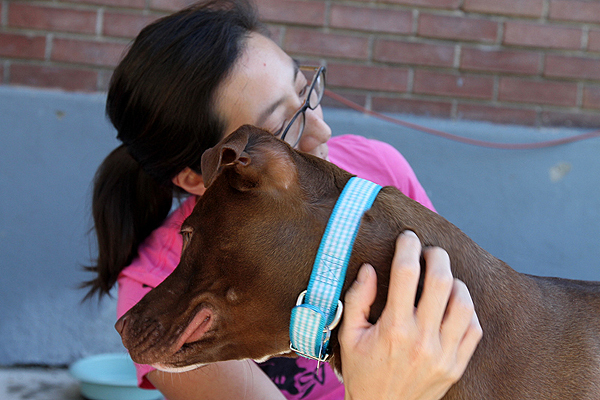 Beautifully written, I wish there were more people like you working in our shelter. My husband and I have have rescues ( one is a pit mix) and we are stronger and more vocal advocates because of it, but I don’t know if I could keep doing your job. @laurapmooney Shelter workers, like the author, are truly special people who do what they do every day for the good of the dogs. We are sure it’s the happy tales of successful adoption that keep them going and knowing that they are making a huge difference in the lives of the animals. It’s posts like this that make me want to investigate volunteering at the local shelter — @theprettychic , have you ever worked with the Spotsy SPCA? — but I don’t know if I could deal with the euthanasia aspect of it..
@skreidle No, we haven’t worked with Spotsy directly however, we volunteer with Bully Paws who rescue dogs from Spotsy. We’re in school to become dog obedience training and plan to do work with them during the externshippart of the course. This is a similar scenario to the shelter I volunteer at (and love) in Baltimore. Thank you thank you thank you for giving this valuable perspective. It’s so easy to condemn these places that see the worst in animal cases (and therefore people’s behavior) but in my opinion it’s worth it to help the animals that need it the most. We all look forward to the day when euthanasia for anything less than the ultimate need is unnecessary. Until then I thank you and all your (and my) brave friends who do this most noble work. @BaltimoreGal So beautifully said, thank you.